One of Scone's most respected and leading boutique operations is set to create some serious sales buzz at this year's Inglis Easter Yearling Sale. Holbrook Thoroughbreds is very selective in terms of its yearling breakup across Australasia's annual yearling roadshow destinations and only takes a draft to Easter when it is of serious quality and will meet the highest of market expectations. Holbrook's 2019 Easter brigade has essentially placed its faith in a highly commercial young sire and another with the credentials and ground-swelling market appeal to suggest it's a faith well placed. First to the hot new kid on the block. Brazen Beau has made a serious impact both in terms of the elite physicality of the yearlings he is siring, as well as on-track performance ... and his oldest are only 2YOs. It's no surprise though. He's a son of exceptional 2YO sire I Am Invincible and he won two of Australia's most sought after sire-making races in the Gr1 Newmarket Handicap and Gr1 Coolmore Stud Stakes. Inglis Nursery winner ACCESSION, plus stakes placed First Dawn and early Slipper favourite (prior to injury) Tassort are a definitive enough sample size to suggest Brazen Beau is going to be the heir apparent to one of the top 2YO-producing spots on the sire ladder for many years to come. The first of 3 Brazen Beaus in the Holbrook draft is Lot 136. He's the colt from Fusaichi Pegasus mare Montelimar, a stakes placed juvenile and half-sister to Listed Widden Stakes winner SUPERFLY. She's already produced 3 individual winners and it's a classy family with second dam ALLEZ FRANCE and Tasmanian SW TIESTO close-up. The second Brazen Beau is the filly from Desert Prince mare Prayer. This is a lovely Ingham family with the dam being a half-sister to triple Gr2 winning 2YO HOSANNAH, herself dam of Gr2 Magic Night winner ALTAR. The final Brazen Beau is from Exceed and Excel mare Uncommon, a 1000m winner and sister to Gr3 Maribyrnong Plate winner EXCEEDINGLY GOOD. She's also a half-sister to multiple stakes winner COMMON INTEREST. If ever you could portent a stallion to be a lay down misere in terms of sire success it would be Vancouver. Golden Slipper winner. By a Champion sire. Elite dam line. Terrific physical specimen. Holbrook has a full deck of Vancouver yearlings. Lot 22 is the first and she's from triple Gr3-winning WA mare FUCHSIA BANDANA. It's her first foal and bolstered by a nice family which tracks to Gr1 Rosehill Guineas winner STAR OF MAPLE. Second up is the colt from Redoute's Choice mare ANTIQUE BELLE, a Listed winner and sister to stakeswinner BROADWAY BELLE. This is a terrific Perth family boasting Gr1 Kingston Town stakeswiner ARCADIA QUEEN, Gr3 winning brother ARCADIA PRINCE and Gr2 WA Derby winners ACTION and ARCADIA DREAM. Lot 361 ditto. By Vancouver from ARCADIA DREAM. Beautiful filly with terrific residual. Lot 388 is also from this family, this time from BROADWAY BELLE – a big, robust colt. Rounding out an exciting Holbrook Thoroughbreds draft is almost certainly their best on paper. Lot 148 is by Gr1 Golden Slipper winner and Leading Australian First Season Sire of 2016-17 in Pierro. In terms of residual this filly sits in the top branches. She's from Nataya Rose, a Canny Lad half-sister to Gold Anthem, dam of STARSPANGLEDBANNER, Champion Sprinter in Europe, GB, Ireland and Australia. It's a family packed with celebrities such as Gr1 Thousand Guineas winner AMICUS, Champion Australian 3YO Colt HARADASUN, 5-time Gr1 winner ELVSTROEM. 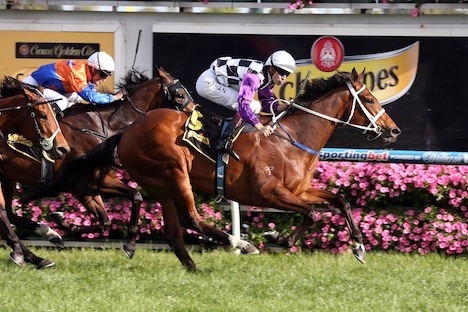 The latest excitement machine from the family appears to be CHEER LEADER who demolished his rivals recently in a Listed race at Moonee Valley. Stay tuned for more. The full Holbrook Thoroughbreds draft can be inspected at Barn K Stables 55-58 & 68-72.